Very fine old crystalline-gold specimen, probably from Tuolumne County. Sold in the 1950s for $65; more recently for $12,500. Published twice. Tuolumne County (/tuˈɒləmi/), officially the County of Tuolumne, is a county in the U.S. state of California. As of the 2010 census, the population was 54,179. The county seat and only incorporated city is Sonora. Tuolumne County comprises the Sonora, CA Micropolitan Statistical Area. The county is in the Sierra Nevada region. The northern half of Yosemite National Park is located in the eastern part of the county. The name Tuolumne is of Native American origin and has been given different meanings, such as Many Stone Houses, The Land of Mountain Lions and, Straight Up Steep, the latter an interpretation of William Fuller, a native Chief. Mariano Vallejo, in his report to the first California State Legislature, said that the word is "a corruption of the Indian word talmalamne which signifies 'cluster of stone wigwams.'" The name may mean "people who dwell in stone houses," i.e., in caves. 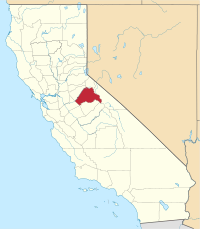 Tuolumne County is one of the original counties of California, created in 1850 at the time of statehood. Prior to statehood, it had been referred to as Oro County. Parts of the county were given to Stanislaus County in 1854 and to Alpine County in 1864. According to the U.S. Census Bureau, the county has a total area of 2,274 square miles (5,890 km2), of which 2,221 square miles (5,750 km2) is land and 54 square miles (140 km2) (2.4%) is water. A California Department of Forestry document reports Tuolumne County's 1,030,812 acres (4,171.55 km2) include federal lands such as Yosemite National Park, Stanislaus National Forest, Bureau of Land Management lands, and Indian reservations. Notable landforms in the county include Table Mountain. Columbia Airport and Pine Mountain Lake Airport are both general aviation airports located in the Southwest and Northeast corners of the county respectively. The 2010 United States Census reported that Tuolumne County had a population of 55,365. The racial makeup of Tuolumne County was 48,274 (87.2%) White, 1,143 (2.1%) African American, 1,039 (1.9%) Native American, 572 (1.0%) Asian, 76 (0.1%) Pacific Islander, 2,238 (4.0%) from other races, and 2,023 (3.7%) from two or more races. Hispanic or Latino of any race were 5,918 persons (10.7%). As of the census of 2000, there were 54,501 people, 21,004 households, and 14,240 families residing in the county. The population density was 9/km² (24/mi²). There were 28,336 housing units at an average density of 5/km² (13/mi²). The racial makeup of the county was 89.5% White, 2.1% Black or African American, 1.8% Native American, 0.7% Asian, 0.2% Pacific Islander, 2.9% from other races, and 2.8% from two or more races. 8.2% of the population were Hispanic or Latino of any race. 94.7% spoke English and 3.5% Spanish as their first language. There were 21,004 households out of which 26.1% had children under the age of 18 living with them, 54.4% were married couples living together, 9.6% had a female householder with no husband present, and 32.2% were non-families. 26.0% of all households were made up of individuals and 11.70% had someone living alone who was 65 years of age or older. The average household size was 2.36 and the average family size was 2.82. In the county, the population was spread out with 20.7% under the age of 18, 7.6% from 18 to 24, 25.3% from 25 to 44, 27.9% from 45 to 64, and 18.5% who were 65 years of age or older. The median age was 43 years. For every 100 females there were 111.50 males. For every 100 females age 18 and over, there were 112.20 males. The median income for a household in the county was $38,725, and the median income for a family was $44,327. Males had a median income of $35,373 versus $25,805 for females. The per capita income for the county was $21,015. About 8.1% of families and 11.4% of the population were below the poverty line, including 16.2% of those under age 18 and 4.0% of those age 65 or over. The Government of Tuolumne County is established and defined by the California Constitution and is a five member elected Board Of Supervisors who serve four year elected terms. The government provides services such as elections and voter registration, law enforcement, jails, vital records, property records, tax collection, public health, and social services. The Board is government for all unincorporated areas. The county seat Sonora is the only incorporated city in Tuolumne County. The Tuolumne County Sheriff provides court protection, jail administration, and coroner services for the entire county with 55,000 population. It provides patrol and detective services for the unincorporated areas of the county. Municipal police department in the county is: Sonora, population 5,000. Tuolumne county tends to vote Republican in Presidential and congressional elections. The last Democrat to win the county was Bill Clinton in 1992. In the 2008 presidential election, 14,988 votes were counted for John McCain with former president Barack Obama receiving 11,532 votes. Tuolumne County is in California's 4th congressional district, represented by Republican Tom McClintock. In the state legislature Tuolumne is in the 5th Assembly district, which is held by Republican Frank Bigelow, and the 8th Senate district, which is held by Republican Andreas Borgeas. The population ranking of the following table is based on the 2010 census of Tuolumne County. ^ a b c "State & County QuickFacts". United States Census Bureau. Retrieved April 6, 2016. ^ "Chief Fuller Historical Monument". Twainhartevisitor.com. Retrieved November 7, 2017. ^ "Local and National Election Results - Election Center 2008 - Elections & Politics from CNN.com". Cnn.com. Retrieved November 7, 2017. ^ Leip, David. "Dave Leip's Atlas of U.S. Presidential Elections". uselectionatlas.org. Retrieved 2018-09-06. ^ "California's 4th Congressional District - Representatives & District Map". Civic Impulse, LLC. Retrieved March 1, 2013. ^ "Census Coverage Measurement". Census.gov. Retrieved 7 November 2017. ^ "2010 Census Interactive Population Search : Tuolumne Rancheria". Census.gov. Retrieved 7 November 2017. ^ "2010 Census Interactive Population Search : Chicken Ranch Rancheria". Census.gov. Retrieved 7 November 2017. "Tuolumne-Calaveras Unit: 2005 Pre-Fire Management Plan, September 28, 2005 Edition," California Department of Forestry and Fire Protection, 09-28-2005, pp. 16. US Department of Education, National Center for Education Statistics. CNN News, "Local and National Election Results - Election Center 2008", CNN News, November, 2008. Wikimedia Commons has media related to Tuolumne County, California.